Australians love to take advantage of the great outdoors. Due to the extreme temperatures felt across Australia over the last few weeks, many families are just as content to enjoy their holidays at home, away from the outdoor heat. Taking the time to relax and enjoy some quality moments with the kids before the school holiday break ends. Marble Bar (Western Australia) has had 40 degrees days for over 24 days straight. They also have the long-held record of consistently being the hottest town in Australia! Adelaide has experienced over 35 degrees. Several areas across western NSW are expecting temperatures above 45C beginning early in the week and continuing all the way through to the weekend. Air conditioners are working overtime during this heat and if not cleaned of airbourne contaminates, it could be costing you a lot more to keep you cool. The indoor air conditioner coils and the internal components, over time get a build up of airbourne particles that the air conditioner has filtered from the indoor air. A dirty aircon puts more strain on airflow and efficiency, which increases the running cost of the system. A professionally clean and sanitise of your air conditioner will avoid a higher than necessary electricity bill. Keep cool during this summer heat! 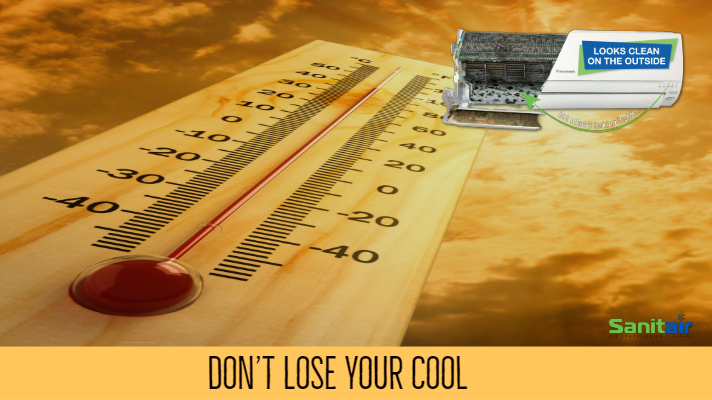 Consider doing something about it now and ensure that your aircon is running at its maximum efficiency. Sanitair Premium Air Con Clean can restore your systems health and improve indoor air quality. Sanitair Premium HVAC Hygiene clean ensures that you and your loved ones are breathing healthy air, guaranteed for 12 months. Take shelter indoors from the extreme temperatures without a worry! FREECALL 1800 130 168 to book a clean today. As the weather warms up and summer approaches, now is a good time to make sure your air conditioner is running at its’ best. One easy way is to clean the filters, this will instantly improve the airflow. Dirty filters hamper the efficiency of your air conditioner and can increase energy costs by 10%. This simple chore should be done regularly. If the air conditioner is working harder, it’s costing you money without making your home more comfortable. Before summer sets in Energy Star recommends that the filters be inspected, cleaned or changed every month. Alternatively, if you feel like your system is losing its oomph, have a Sanitair HVAC Hygienist to clean the filters; clean and flush the coils, drain pan, and drainage system; and apply the treatment to the coils to prevent mould growth for a minimum of mould free. When the filter is removed for cleaning, check the surface of the evaporator coil, which will now be visible. If there is dust, debris or mould contamination on the surface call a Sanitair HVAC Hygienist to remove it. The coils soft fins can be very fragile and if too much pressure is applied can be easily damaged. Be careful not to damage the fins. With window air conditioners, some filters are easier to change than others. Cleaning the filters may be needed more often during the hottest part of the summer. When cleaning it, remove debris with a vacuum then wash the filter in warm, soapy water; be sure filters are dry before you reinstall them. 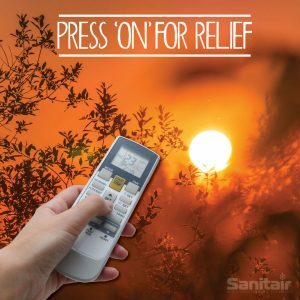 Sanitair Premium Clean and Sanitise will improve the health of your air conditioner, improve air flow and ensure you keep cool this summer. If your air conditioner is not working properly don’t replace it, it may just need a good clean.